I’d like to offer an alternative approach that leverages insights from emergence, antifragility, and analytics to circumvent standard “top-down” strategies. In recent years, the term “hacking” has grown in popularity, especially “growth hacking” within the marketing field. Growth hacking involves using analytics to target specific consumer groups, test which messages are successful in driving viewership, and scale the most effective strategies. Orghacking offers a way to implement rapid, testable, repeatable, and scalable interventions that bypass conventional organizational limitations like hierarchy, stovepipes, and communications protocols. Each intervention caters to the values of key demographic groups and leverages the many social networks and relationships that exist among employees. Many large-scale change efforts see the world from a top-down perspective. Leadership has an idea, they develop a policy to capture the idea, and they rely on managers to implement the policy at the ground level. In this approach, information moves up through the hierarchical chain while decisions flow down. The problem with this strategy is that it often fails to appreciate the complexities inherent within an organization. Employees often interpret and respond to situations differently. They may also interact and organize very differently across departments. As a result, organizations function more as a network of clusters, where employees congregate around certain individuals and processes and share ideas and values with those closest to them. A top-down approach may easily glaze over these factors, leading to unintended consequences such as employees misinterpreting the policy or outright ignoring it. The disconnect between top-down strategies and the way organizations inherently operate makes it difficult to align the workforce to a new strategy and vision. Orghacking, on the other hand, bypasses the standard top-down approach and instead moves from the focal point outward. 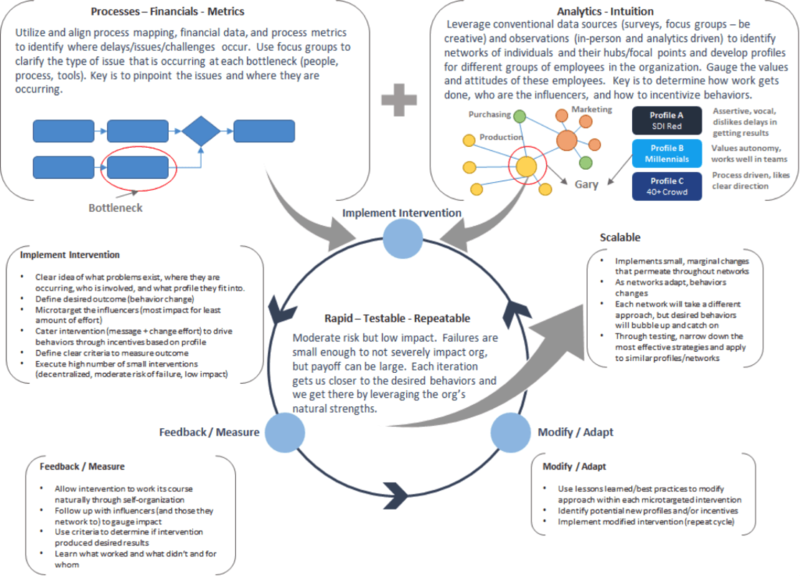 As the diagram above shows, orghacking involves a combination of process mapping and culture-based analytics to pinpoint what issues exist, where they occur, and who is involved. It then uses precise interventions to target hubs within the organization’s social networks, shape the intervention to tap into the influencers’ values to incentivize behaviors, allow the intervention to spread throughout the social network, measure its impact, and modify the approach. In this way, orghacking flips conventional logic on its head by making interventions small in scope, targeted to the individual, and adaptable to new insights. One of the more succinct ways to identify bottlenecks is through process mapping. Process mapping allows us to see the flow of how products/deliverables are produced in an organization. We can gauge how effective certain parts of the process are by obtaining feedback from focus groups, looking at financial data to assess returns, and examining process metrics to determine where delays occurred. Through this approach, we can pinpoint specifically what challenges exist, what type of issue it is (people, process, tools related), and where it exists in the process. Organizations are overflowing with data that can be used in orghacking. Everything from personality indicators to satisfaction surveys give us insights into the different types of people who work at an organization, how they think, and what they value. Depending on the level of granularity in the data, we can even look at correlations among the responses to identify connections among different sets of values/attitudes and demographics. Examples would be if people who rate the organization low on trust also tend to rate the organization low on delegating authority. Or, whether males in purchasing tend to rate the organization low on trust also tend to value clearly defined processes. The goal is to identify hidden insights about our employees and find connections. In the end, we can develop profiles for different types of people in our organization, each including a demographic indicator and one or more values/attitudes. Emergence and self-organization are fundamental to how organizations operate. Understanding how people organize to get work done is a key component of orghacking. Observations can be conducted in-person by seeing who talks to whom and/or through data driven methods such as counting the number of individuals that enter a given room or office. Observations should be validated with employees (even anecdotally) to verify their accuracy and determine the context of the discussion, like why people are congregating around a specific person. This helps us understand who are the key influencers in the organization that help move work forward. Notionally, we assume that people congregate around others with similar values and perspectives, enabling influencers to spread ideas and permeate change. Orghacking is different from other approaches in that it aims to change the most fundamental units within organizations. Ultimately this comes down to identifying the influencers and those closely connected to them, communicating in their language, and developing incentives based on their profile to drive the desired change in behavior. This can increase the likelihood that a message and intervention will stick. Another difference is how interventions are implemented. Orghacking implements numerous bite-sized interventions that invoke small changes in someone’s behavior. Each intervention is conducted using an A/B test approach, where there are intervention and control groups. This allows us to estimate the impact and effectiveness of any one approach. Since the change is small, it can be easier to assimilate, and follow-on interventions can be conducted in rapid succession. Interventions are also given time to work their way through the various social networks and will look different across groups. For this reason, change occurs much more organically to the unique culture of a particular group or sub-group, allowing it to scale over time. Finally, due to its small size and scope, the risks associated with any given intervention are fairly miniscule. The failure of any one intervention does not jeopardize the whole effort. In fact, failures give us ample opportunities to fine-tune our strategies. It’s important to have a clear idea of the desired outcomes from an intervention. Outcomes should be measurable, even with something as simple as a yes/no metric. Outcomes help us determine whether an intervention was successful. The lessons learned from this step allow us to determine what went wrong and make adjustments to improve the approach in the future. While some approaches succeed, others will fail. These opportunities enable us to modify our strategies to optimize the message and incentive. Best practices within one intervention can be applied to others as well. Eventually, we can fine-tune our approach to a set of key strategies that work for a given group, or even across groups. Then, we can broaden the outreach of the interventions to other hubs and influencers. Over time, larger segments of the organization will start exhibiting the desired outcomes and effectively internalize the change. The effectiveness of change ultimately depends on how it is packaged. Orghacking uses micro targeting to fine-tune the package to better incentivize behaviors. By doing so, it gives us a highly adaptable and effective way to systematically internalize change within our organizations. In this way, it can be a preferable alternative to traditional top-down change strategies. Stuart Farrand is an experienced analyst with an extensive background in diagnostic methods. His work focuses on the intersection of risk, emergence, and organizational culture. He specializes in using data insights that enhance how organizations identify, approach, and learn from complex issues and hard to detect risks. Stuart is a former member of the gothamCulture team and currently works in higher education.